Well, not a real trip. But a nice mental break at this time of year! 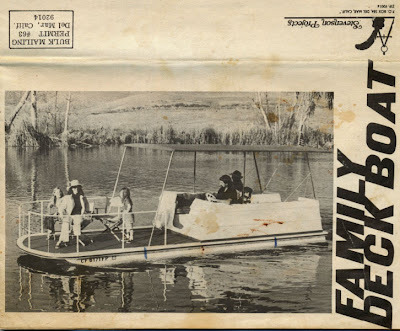 I was cleaning out boxes of "old stuff" in the office when I came upon these plans for building a pontoon boat in a dusty storage box. The plans are still in pretty good shape except for some waterproof glue stains on them. I think that every man wants to build a boat and possibly sail around the world - or at least as far as the South Pacific. Only a few actually make it into the ocean, like Gerry Spiess in Yankee Girl. We hadn't owned our cabin on Long Lake in Burnett County, Wisconsin for long when Linda saw these plans in a magazine around 1979 and ordered them for me. 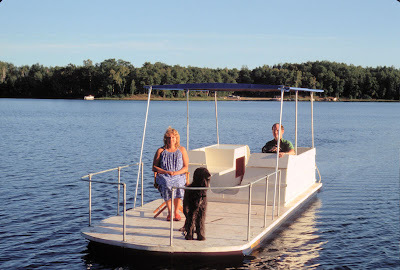 Soon I had three deck sections and two twenty-two foot long pontoons sitting in the back yard of our South Minneapolis home. All these parts were made of 1/4" or 3/8" plywood except for the sides of the pontoons. Those were crafted from 1x12 pine. Now a wise person might have given some thought to questions like "How high off the water do you think that deck is going to be?" or "How long do you think a 3/8" deck is going to last?" before starting this project, but not me. 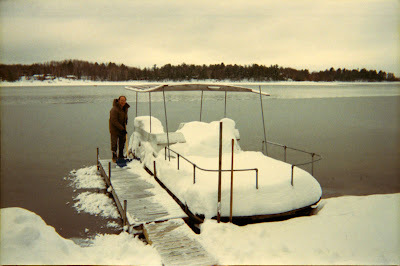 With the help of a rental truck, I soon had the completed parts up at Long Lake. I couldn't wait to put the boat in the water and go fishing. It took another summer to build the seat boxes and canopy but by the following chilly Labor Day we able to take the family for a ride. 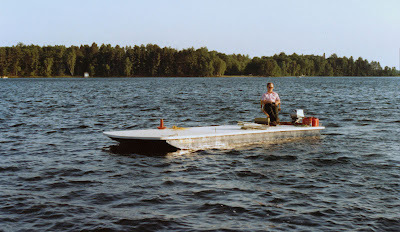 Over the course of the next twenty-seven years I fiberglassed the wood pontoons, replaced the wood pontoons with factory-made aluminum, built a new deck, rebuilt the seat boxes, and lost track of the number of times I replaced the canopy. 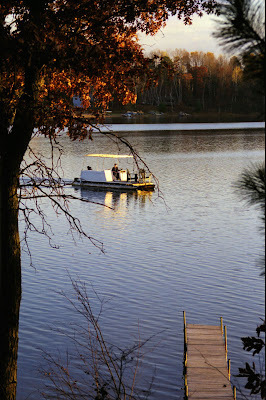 But for all that time, I am sure I provided a frequently entertaining topic of discussion for the neighbors on the lake. Not the least of which might have involved, "Bet he wishes he took that boat out of the lake before Halloween!" in early November of 1991. 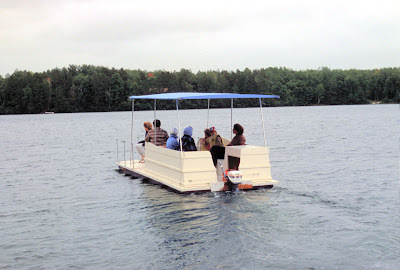 In spite of the hastle with maintenance, the boat supplied many pleasant memories over the years. 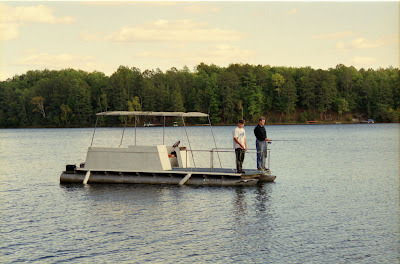 The boat plans came from Stevenson Projects which is still in business although most of their plans are for sailboats. Pete Stevenson tells me that he sold the original version of this boat long ago but ran across it once out in the San Diego Harbor. The new owner yelled, "Watch this!" as he jammed on the power. He'd put a 50 horse Merc on it and the thing actually took off planing! When we traveled to the Mena House golf course in Cairo, we shared a taxi with another passenger. After dropping the other passenger off at her home, our driver struck up a conversation in English. Of course, the driver was amazed to find an American who had not voted for Obama. Obama would have polled in the high ninety percent range, if not one hundred percent among all Egyptians, judging from conversations that I've had on this trip. As usual, when I said, “So, now that we have a new president, when will you have a new president?” the conversation becomes more interesting. Our driver, like most Egyptians, has only known one president. Many Egyptians refer to him as "president for life." Others as Pharaoh. Last night we stopped by a bakery and the man behind the counter said to Linda: "German?" "Obama!" was his smiling response. Most Egyptians are well aware of out new president's name. Sitting in our dining room awaiting the delivery of furniture, we ponder some of the mysteries of Egyptian architecture and construction. For example, wouldn't door installation be simpler if the frames were square? This frame slopes downward by just over an inch across its span of 36 inches. 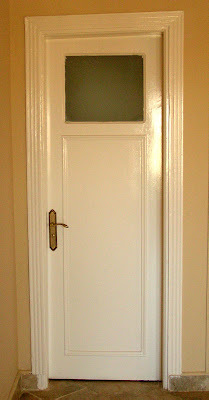 Since it is a bathroom door, it naturally has a window in it. All bathroom doors here do. Is this to allow light in or to let us on the outside see a light on in the interior marking it as occupied? An ad in the Star-Tribune caught Linda's eye. The Golden Strings appearing at Jax Cafe. Too much nostalgia there for old-timers. We signed up, taking Linda's mom to celebrate her 80th birthday. I first moved to Minneapolis in the fall of 1967. The Twin Cities was pretty much lacking in diversity in the restaurant scene. But there was no question of what was the best eatery - Charlie's Cafe Exceptionale, downtown. Sure you could get a good steak at a couple of places - say Murray's downtown or Jax in "Nordeast" - but Charlie's was the place to go to for the best dining experience in the area. But what if you wanted more than just a good meal? How about a show and a dining experience? Then you headed to The Flame Room at the downtown Minneapolis Radisson Hotel. The Golden Strings supplied the show. Memory plays funny tricks as you age. I would have described the Golden Strings as a group of twenty strolling violin players. Linda said "no, I'll bet it was forty." It turns out that there were just eight violins - but there were two baby grand pianos. Cliff Brunzell founded the Golden Strings in 1963 when he signed a thirteen week contract to play the Flame Room at the request of Curt Carlson, owner of the Radisson. Brunzell ended up staying eighteen years and created probably the best known violin show in the country. By the time Linda and I first saw it, the show included two Olympic sized torches powered by natural gas that truly put the flame in "Flame Room." This show at Jax featured Cliff as host and lead violinist (I calculate his age at about 87 based on the paragraph about him at this link) along with three or four other veterans of the original group. There were only six violins but as they strolled through the tables in Jax' banquet room you could picture yourself back at the old Radisson, long ago torn down. A couple of younger musicians filled in the string section and Brunzell brought along one heck of a jazz vocalist in Charmin Michell to lead us in a few Christmas Carols. Jax owner, Bill Kozlack, greeted each of the guests as we entered the banquet room, so I guess he considered it a special night as well. The show was great. Dinner was fine traditional American - I had the prime rib. And. 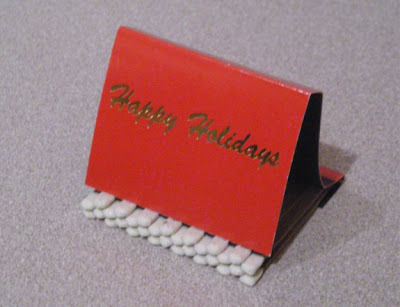 of course, Jax provided a book of matches on the table for each member of our party - these weren't personalized but I'll bet they strike a familiar chord for anyone who has ever dined there. 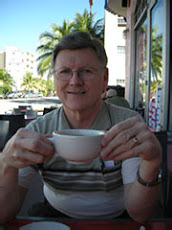 I prepared a number of posts for the Travel Blog while we were in Egypt but am just now starting to post them. We were pretty busy most of the two weeks we were all together in Cairo and I only got to an internet cafe once. One of our favorite places to visit the internet is at Cilantro - a modern style coffee house. We just never got there on this trip. I also neglected to bring along adequate photo editing software on the baby Asus eee computer that I was using on the trip. Bottom line, I will be posting about the trip on a delayed basis starting today.